Zion Market Research has published a new report titled “Automotive EGR System Market by Product (Valve, Cooler, and Pipe), by Vehicle (Passenger Cars, Light Commercial Vehicle, and Heavy Commercial Vehicle), and by Application (Diesel Powered and Gasoline Powered): Global Industry Perspective, Comprehensive Analysis, and Forecast, 2018 – 2026”. 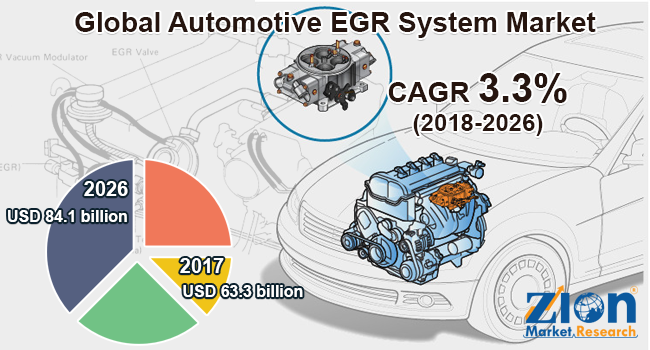 According to the report, the global automotive EGR system market accounted for USD 63.3 billion in 2017 and is expected to reach USD 84.1 billion globally by 2026, with a CAGR of around 3.3% between 2018 and 2026. Automotive exhaust gas recirculation system (EGR) helps in reducing NOx emissions in internal combustion engines. Stringent emission legislations have compelled vehicle manufacturers to have lower exhaust emissions systems. The systems also help in reducing the fuel consumption of vehicles. Increasing production of vehicles is fueling the growth of the automotive EGR system market globally. In 2017, the total number of vehicles manufactured across the globe was 97,302,534 units as compared to 77,583,519 units in 2010. Further, in 2016, global cars manufactured were 72,105,435 units as compared to 68,539,516 units in 2015. These numbers are anticipated to increase during the forecast timeframe owing to the initiatives taken by governments of developing economies, such as China and India, to promote the manufacturing sector. Thus, it is projected that automotive EGR system market will propel during the forecast period. Diesel-powered vehicles are expected to make a considerable contribution in the growth of automotive EGR system during the forecast timeframe. In 2017, it was estimated that about 45% of the purchasers in Western Europe preferred diesel-powered vehicles. Further, the escalating demand for commercial vehicles is expected to fuel this market’s growth. In 2016, total commercial vehicles registered were 24,398,752 units as compared to 23,380,189 units in 2015. This number is expected to elevate owing to the rising investments made by companies, such as Uber and OLA. Thus, the rise of automotive EGR system market during the forecast timeframe is evident. On the basis of application, the global automotive EGR system market is bifurcated into a diesel powered and gasoline powered. The gasoline-powered segment holds the larger market share currently and is anticipated to grow further during the estimated period. This share can be attributed to the increased production of gasoline-powered vehicles. Further, the automotive EGR system market is divided on the basis of product into valve, cooler, and pipe. The pipe segment is projected to grow at a significant rate during the forecast timeframe. Asia Pacific is projected to hold a substantial share in the global automotive EGR system market during the forecast period. China, Japan, and India are expected to make considerable contributions to this market. This growth can be attributed to the increased production of vehicles in this region. North America is anticipated to grow at a significant rate in the global automotive EGR system market owing to the technological advancements made in the automotive sector. Prominent manufacturers in the global automotive EGR system market are Mitsubishi Electric Corporation, Continental AG, IAV, Friedrich Boysen GmbH & Co. KG, Denso Corporation, Delphi Auto Parts, ElringKlinger AG, Knorr-Bremse AG, Lucas Electrical, MAHLE GmbH, NGK Spark Plug Co., Ltd., BorgWarner Inc., Hitachi Ltd., Eberspacher Group, and Johnson Electric Holdings Ltd., among others.